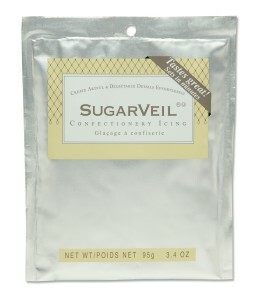 SugarVeil is a dry mix. After you add water and beat it a few minutes, you enter a place where cake and dessert decorations have never gone before: Incredibly delicate lace, for example, or monograms that look sculpted. Or a cascade of dots you can make in a flash, all rounded to perfection. Even an amazingly paper-thin ‘fabric’ you can gather into waves. Made from fresh, natural ingredients – delicious flavor! 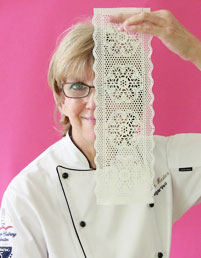 Michele Hester invented SugarVeil – the icing and the company – so that cake and dessert artists at every level, novice to professional, could realize the complete range of their artistic vision.